A good bio pic of a famous person must have several qualities: 1. It must represent both the person society knows and provide a new look at how they became that person. 2.It must be a story worth telling that gives an opinion on the person's life (otherwise it's a documentary) and 3. 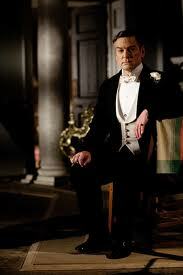 It must NOT, under any circumstances, attempt to give a birth to death summary of the person's life. Following those simple rules will usually give a movie worth watching. Thankfully, My Life with Marilyn does a great job with all three. As the title implies, it's just a short period of time on the movie set of The Prince and the Showgirl, directed by Laurence Olivier (Kenneth Branagh). 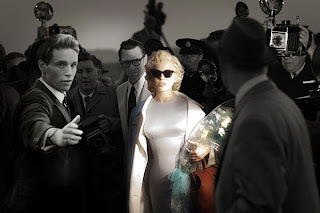 We follow the process through the eyes of 3rd Assistant Director Colin Clark (Eddie Redmayne), who wrote the book upon which My Week with Marilyn is based. 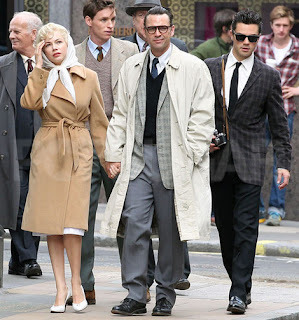 Marilyn (a brilliant Michelle Williams) has just married Arthur Miller (Dougray Scott) and he accompanies her to the set in England. However, he has quickly realized that being married to Marilyn is nothing like he thought and he quickly flees back to see his children. Marilyn doesn't really have the ability to manage either herself or her career and she latches on to Colin, at first just another adoring fan. He tries to get her to the set on time - which has become nearly impossible given the cocktail of uppers and downers she's been taking to deal with fame, marriage and a lack of self-esteem. Marilyn and Colin become fairly inseparable but the movie gets made and their relationship ends. For the first point: Marilyn does a great job of representing the real life Marilyn and the icon. When she gets off the plane carrying a bouquet of flowers amid a lightning storm of flashbulbs you see the image that she's known for. Later when we see her heartbroken after reading some of the things Miller has written that must be about her, we see the non-public persona whose marriage is falling apart after less than a month. For the second point, giving an opinion is somewhat subjective - sometimes an unbiased representation works, but glossing over a troubled soul doesn't give us anything new and overrepresenting an awful person isn't usually worth watching. Marilyn gives an opinion, and one I'd never heard presented quite like this - that Marilyn was both self-obsessed and had no self-esteem. So she would choose people to tell her what to do and follow their opinions blindly. Eventually she wouldn't agree and would just dump them, which is what happened to Colin after about a week. The filmmaker's opinion (however much based in reality, and it seems that it was) is clear. And finally, it fulfills the final requirement perfectly - it's barely a month of her life. Given that they shoot a movie, I think it's a little more than a week, but not much. And, more importantly, the movie doesn't bother to inform us of much beyond that month. There's only one title card at the end saying that Marilyn went on to make Some Like it Hot, nothing else about her death. The filmmakers don't over inform the audience of things we already know or could look up easily. There are small references to Marilyn's other exploits and marriages, but it doesn't dwell on that, which I really liked. The supporting cast is also particularly good, Branagh trying to stage manage a ridiculous set, Judi Dench as a cast member trying to help Marilyn (through veiled mocking), and particularly Julia Ormond as Vivien Leigh, Olivier's wife. She has some great lines about watching her husband obsess about Marilyn and acknowledging that she was once that girl, but that it's okay that she's not anymore. Oh, and Emma Watson does a good job as Colin's non-Marilyn love interest. Overall, I really enjoyed this movie. Eddie Redmayne is very charming and innocent falling for the big movie star. And Michelle Williams totally deserved her Oscar nomination for playing an icon without imitating an icon.